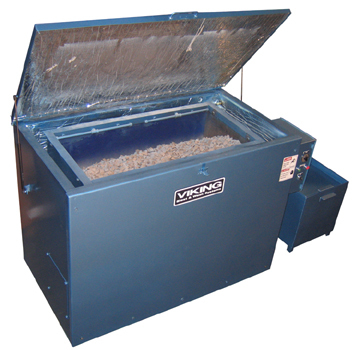 Vibratory equipment utilizes fine abrasive material (media) and a special process where vibrating causes the media to scrub parts clean. This is one of our most economical ways to batch-process small quantities of parts to remove oils and greases. The ceramic or aluminum media is gentle enough not to damage delicate parts. However, this process uses media tough enough to de-burr and polish. Allen Woods has served customers in the printed circuit board industry for over 60 years; more recently we have expanded our chemistries and expertise to the automotive remanufacturing and rebuilding industries, as well as rail and industrial manufacturing across the nation. Our mission at Allen Woods and Associates is to not only provide the highest quality products to serve your needs, but continue our relationship and offer expert service for troubleshooting any issues you may encounter.